As communication technologies change, so too does digital etiquette. There are ever-evolving, unspoken rules, for instance, to the art of liking or commenting on a friend’s Instagram post. Periods, exclamation points, and no punctuation at all can communicate a wide range of emotions and inflections in a text message. Most teenagers seem to know these rules intuitively. Yet many teenagers are clueless when it comes to emailing professors and college admissions officers. 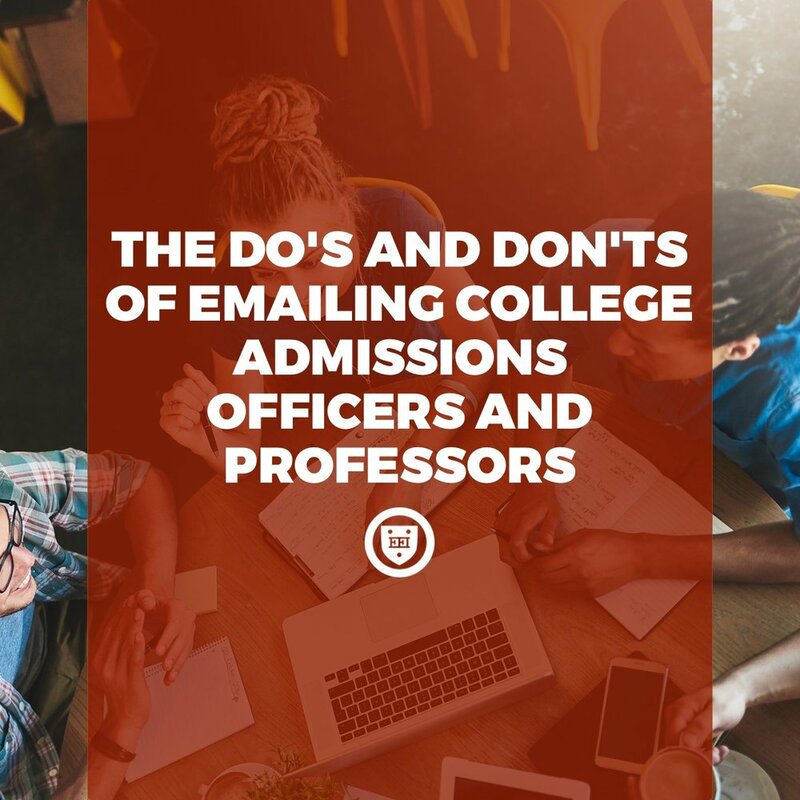 If you’re a college-bound high school student, you need to master the intricacies of email etiquette—or risk offending the wrong people. Don’t leave the subject field blank. A blank subject line suggests a degree of informality or carelessness that’s completely inappropriate for communicating with college professors and administrators. Keep the subject line short but communicative. Something like “Question” is far too broad. Opt instead for the subject matter of your question: “ENGL 120 Reading List,” for instance. Avoid overly long subject lines. “Question Regarding the Reading List for English 120: Introduction to English Literature,” for example, is cumbersome and irritating. As a general rule, keep things short and formal. Make sure to begin every email you write with an address line: “Dear Professor Smith,” is a safe and effective formula, at least for a first email. Do not, under any circumstance, begin an email to a college professor or administrator with “Hi,” “Hello,” or “Hey,” by itself. If you develop a rapport with the addressee, you can safely write “Hi Professor Smith,” for instance, but never simply “Hi,” without a name attached. Always include the addressee’s name. This can present some challenges, but a little research can go a long way. There are a range of titles for people who teach at universities. Generally speaking, these titles include “professor” (for those on the “tenure track”), “lecturer” (for those not on the tenure track), “instructor” and “teaching assistant” (for those teaching while pursuing a graduate degree). You don’t need to delve into the intricacies of the academic division of labor. Opt for the safe “Professor” title for those who teach at a university. It’s safe to stick with that title until you’re told to change course. For administrators, try Googling their name first. Are they the director of a program? “Director Smith” is a safe approach, in that case. Do they have a PhD? “Dr. Smith” works, then. “Mr. Smith” or “Ms. Smith” is also a safe bet for a first email. So, to sum up: For a teacher at a university, write “Dear Professor Smith,” with a comma at the end. For an administrator, write “Dear Director Smith” if they direct a program, “Dear Dr. Smith” if they have a PhD, or “Dear Mr./Ms. Smith” if neither applies or if you can’t find additional information. If you are in an email exchange, look to the addressee’s signature for guidance. If a professor or administrator signs their email with a first name, it is generally safe to take that as a sign that you can address them by their first name. So, if a professor signs an email with, for example, “Tina,” it is then safe to respond with an email that begins, “Dear Tina,” or, if the conversation seems slightly less formal, “Hi Tina,” always with a comma at the end. If a professor or administrator signs with their initials (“TS,” for example) or with a formal email signature (featuring title, department, and contact information), then continue to address them with formal titles (Professor, Dr., Mr./Ms.). In general, keep emails short and formal, just like the subject line. College professors and administrators are very busy, and they receive many emails every day. Don’t presume that your concern is the most pressing issue for them. Make sure your sentences are grammatical, free of spelling errors, and tonally appropriate. Avoid slang and imperatives (“Grade my paper quickly,” for instance). Use “please” and “thank you.” Be polite and respectful, just as you would if you were to address an elder you respect and admire. You should always sign your emails. You can sign with your first name alone or both your first and last name. For emails to college professors and administrators, appropriate signature lines include “Sincerely,” “Thank you,” “Best wishes,” “Best regards,” and “Best,” always with a comma at the end. Follow this line with your name. If you receive a reply from a college professor or administrator, make sure to reply back. In general, you should be the one to write the last email in an exchange. Thank your addressee for their response. As with the initial email, make sure to begin with an address and end with a signature. I am currently enrolled in your Fall 2018 ENGL 120. I was wondering which edition of Shakespeare’s Hamlet we would be reading in class. I was hoping to get a head start on the course reading this summer. Thank you for your time. Thank you for getting in touch. We will be using the Arden edition, Third Series. There should be copies available at the university bookstore soon. Thank you for letting me know about the Arden edition. I am very much looking forward to the course. Have a terrific summer! Justin spaces his email perfectly: Address line, two hard returns, body, another two returns, and a signature with no space between the first and last line. He maintains a formal and friendly tone throughout the exchange. Notice his tone in the first email: “I was hoping to get a head start” strikes the right key. Something like “I want to start reading the books now” would communicate the same information, but it would come off as too informal and tonally aggressive. Your tone should subtly recognize the authority of your addressee. Justin also replies to the reply, making sure to thank his professor for supplying the information he needed. Follow Justin’s lead, and you’ll be sure to avoid ruffling the wrong feathers.